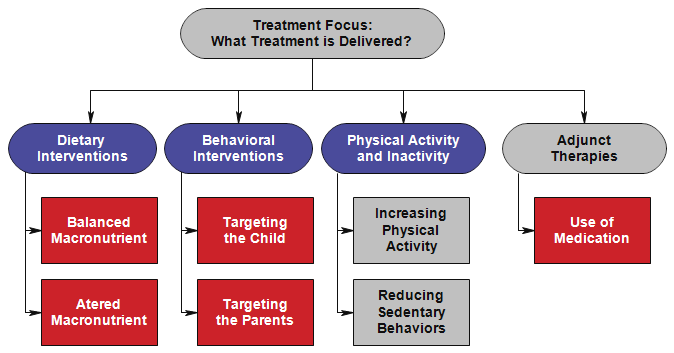 Treatment Focus: What Treatments are Delivered, and How Effective Are They? Within each of these topics are a series of sub-topics and questions. Click on one of the topics on the left navigation bar of click on one of the colored boxes in the topical map below. 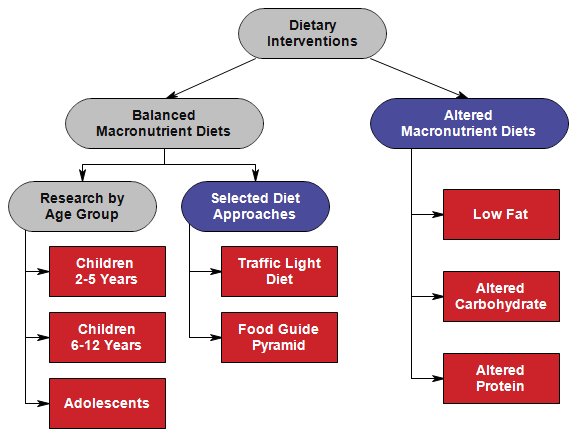 We distinguish between Balanced Macronutrient dietary approaches and Altered Macronutrient dietary approaches. We also classify studies based on the age of the child and the prescribed daily calorie intake level. To use the topical map to navigate to one of the dietary treatment topics, click on the topical map below or on the topics on the left navigation bar.